Filing Chapter 7 bankruptcy may be a way for Florida consumers to wipe out various types of debts and start over, free of the hassle of constant creditor harassment. Most people think of Chapter 7 bankruptcy when they think of getting out of debt, and that’s because it’s the most common way for people to end their bill problems and start over. Most people who file for Chapter 7 get to keep all of their property, but that’s because an experienced bankruptcy lawyer knows how Florida cases are handled – one of the hallmarks of a good lawyer is that they won’t let you file a Chapter 7 bankruptcy unless it’s right for you. There are pros and cons to filing Chapter 7, and your lawyer can review these with you in order to help you make an informed decision as to whether you should file. Filing for bankruptcy is very much a partnership between you and your lawyer. Working together, you’ll put together information about your income, assets and debt. You’ll identify your sources of income, review expenses, and work through any issues that could be a problem in your case. In doing so, you’ll eliminate surprises. Because really – do you want to file a Chapter 7 bankruptcy case only to be surprised after it’s filed? There is a stack of forms that need to be completed for your Chapter 7 bankruptcy case. In fact, a complete file will take up between 50 and 60 pages of information. Don’t worry, you won’t be sitting at the keyboard figuring it all out – that’s one of the reasons you hire a lawyer in the first place. We know what needs to be disclosed, and the right way to get it done. Before your Chapter 7 bankruptcy is filed you’ll need to go through a credit counseling certification process with a court-approved provider. It takes about 20 minutes to complete, and you can get it done by phone or online. We provide you all this information. This is not the same kind of credit counseling you see on late night TV. In fact, it’s just a formality. You can thank Congress for putting this rule in place in 2005; it amounts to a waste of 20 minutes of your life. The minute the Chapter 7 bankruptcy case is filed, you are assigned a case number. Assuming you haven’t filed other cases within the past 12 months, an automatic stay goes into effect that stops most types of credit actions against you. There are limits to the automatic stay, but we’ll discuss it when we talk. About one month after filing Chapter 7, you will need to attend a meeting with your creditors. Though creditors are invited to come to ask you questions about your case, this rarely happens. In fact, it’s so routine that the entire meeting takes about 10 minutes and is comprised of questions that are written down in a handbook provided to the case trustees by the U.S. government. Objections to your bankruptcy must be raised and discussed about this point, and your presiding judge will make any rulings as necessary. But the judge does not attend your meeting of creditors. It costs you nothing to sit down and talk with an experienced bankruptcy lawyer. Some lawyers will charge an arm and a leg to give you the time of day, but not us. Make an appointment, come in and sit down to talk about your problems. We’ll map out all of your options (even the ones that don’t include bankruptcy) and put together a Plan to make your future better than your present. You probably have a ton of questions, and I want to answer them. You can contact me by email or call (407) 749-0080 to set up a free, no-obligation consultation. And when you’re done with that, please take the time to read the Florida Bankruptcy Blog. 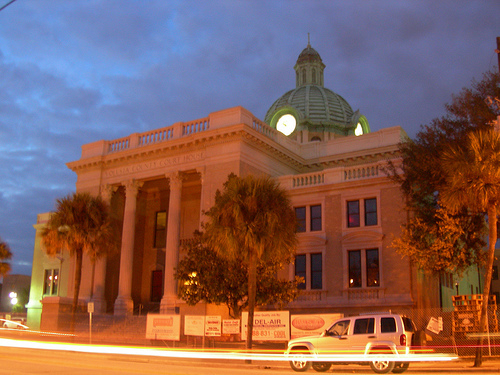 The photo of the Old Volusia County Courthouse was taken by jimmywayne.